Another clash between the two sides over the moons in and around the Heimatar region occurred, this time over a tower in the Kourmonen system in The Bleak Lands region. Did he say Jump [JMP-N], FETID [FETID] and allies brought an armor battleship fleet against Dead Terrorists [IKILU], Shadow Cartel [SHDWC] and allies’ Proteus strategic cruiser fleet. The two sides fought fiercely, with the fight immortalized in the video. The Huola system in The Bleak Lands continues to uphold its reputation as one of the bloodiest systems in New Eden in general, and in the Amarr\Minmatar war zone in particular. This isn’t helped either when militia groups and pirate alliances meet in bloody battles in the system, such as in this case when No Points Necessary [CAGE] and Dead Terrorists clashed with Local Is Primary [CTRLV] and Sons of Black Rise [SOBR.]. Continuing their counter push against Did he say Jump and FETID, Dead Terrorists and Shadow Cartel press forward against the allies, this time meeting them head on in the Auga system in the Heimatar region. Did he say Jump and FETID’s armor battleship fleet once more exchanged blows with Dead Terrorists and Shadow Cartel’s Proteus fleet, this time reinforced by Snuffed Out [B B C] and Project.Mayhem. [16-13]. The result can be seen in the video. 9/1 Pandemic Legion and allies versus Providence Bloc and Stain-Wagon. The F9E-KX system in the Catch region hosted a major battle with more than 1100 players packed together. Stain-Wagon (SW) coalition brought a Typhoon battleship fleet, Providence Bloc brought a Cerberus heavy assault cruiser fleet, Pandemic Legion [-10.0] and Northern Coalition. [NC] brought a Proteus fleet, with Northern Army [NARM] and Pandemic Horde [REKTD] also being present. What followed was an hour long, bomber heavy, Time Dilation crippling battle. Pandemic Horde had been waging a war against Darwinism. [DRWIN] over the moons of the Khanid region. While at the start it seemed as though Pandemic Horde would easily win the war, Darwinism managed to secure the help of allies such as DropBear Sanctuary [DROP], LowSechnaya Sholupen [-LSH-] and even DARKNESS. [DARK.] and strike back at Pandemic Horde, managing a major victory in the Nandeza system of the Khanid region. In what should have been a typical tower bash, Pandemic Horde’s capital fleet was ambushed by the allies, the results captured on video. 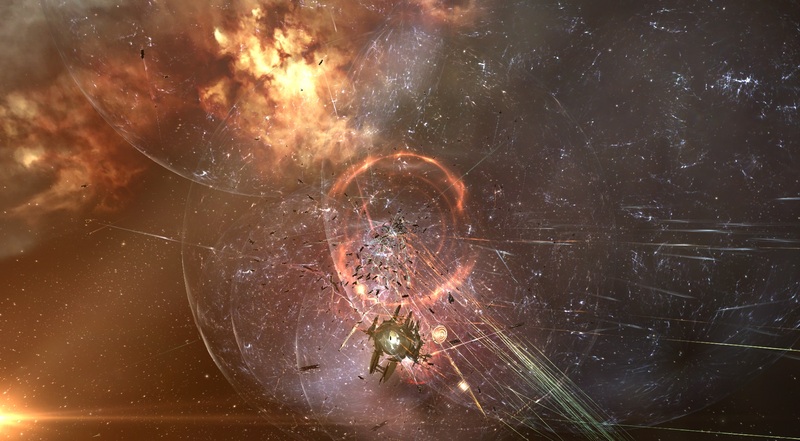 Wormhole residents No Vacancies [NVACA] took a stroll in the North of New Eden, entering Imperium space with a small faction battleship gang backed by a triage Archon carrier. The force quickly encountered the locals who promptly brought a Hurricane battlecruiser fleet to fight the intruders. The result can be seen in this video. Once again, the Imperium attempts to fight the Venal based alliance Out of Sight. [OOS], attacking one of its towers in the MC6-5J system of Venal. Though losing the tower, Out of Sight.’s Tengu strategic cruiser fleet made sure it wasn’t without cost for the Imperium forces, aided in the task by Northern Coalition.’s Proteus fleet. Celebrating 5 years to the foundation of Pentag Blade [P.T.B] corporation in Curatores Veritatis Alliance [CVA], Providence Bloc took a small capital force down to Catch to see if anyone would jump on it. As it turns out, someone did, with Pandemic Legion bringing a few of its titans along to shoot some fireworks. A fight between Test Alliance Please Ignore [TEST]’s Maelstrom battleship fleet and Triumvirate. [TRI]’s Rattlesnake battleship fleet is visited by a Pandemic Legion Proteus fleet with a surprising result for all involved. Another clash between Out of Sight. and the Imperium, this time in the V3X-L8 system in Venal. Both sides brought Cerberus fleets. Usually when two opponents bring the same composition, the fleet with the most pilots would prevail. However this video is a shocking proof to the contrary. Hiya, I’m really glad I have found this info. Nowadays bloggers publish only about gossip and web stuff and this is actually annoying. A good site with interesting content, this is what I need. Thank you for making this web site, and I will be visiting again. Do you do newsletters by email? Hiya, I am really glad I’ve found this information. Nowadays bloggers publish only about gossip and net stuff and this is really frustrating. A good site with exciting content, this is what I need. Thanks for making this web-site, and I’ll be visiting again. Do you do newsletters by email? I am very new to web design as I have no prior experience as well as know little HTML. I just would like to know what the best software program is to purchase to develop blog sites. I have actually downloaded CS5 Design Premium with Dreamweaver and also Photoshop, yet I understand this is a little sophisticated for me as well as pricey!!!. Does any person have ideas of software program or ways to construct blog sites and also websites easily and also economical?. MANY THANKS!. Hello there. I found your website via Google even as looking for a related matter, your website came up. It looks good. I’ve bookmarked it in my google bookmarks to come back then. Hey there. I discovered your site by means of Google even as looking for a related matter, your web site came up. It looks good. I’ve bookmarked it in my google bookmarks to come back then. Hey there. I found your website by way of Google at the same time as searching for a related topic, your web site came up. It seems to be great. I have bookmarked it in my google bookmarks to come back then. Hey there. I discovered your blog by means of Google whilst searching for a similar matter, your web site came up. It seems to be great. I have bookmarked it in my google bookmarks to come back then.